The right and left atria are located at the base of the heart and are separated from each other by the interatrial septum and from the ventricles by the cardiac skeleton (7). Structures common to all large mammalian atria include the sinus venosus, the crista terminalis, the fossa ovalis, the Eustachian valve, the Thebesian valve and right and left atrial appendages (3, 8, 9, 10, 11). However, these structures can vary between species in their relative locations within the atria or in their overall shape and size (3, 8). All large mammalian hearts also have two vena cava returning blood from the body to the right atrium whose ostia vary in relative locations between humans and animals (3, 8, 10). 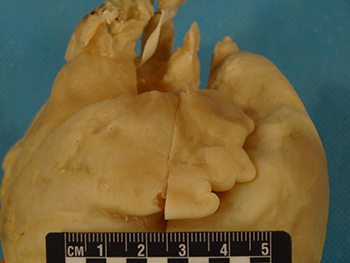 Pulmonary veins, the number of which varies between individuals as well as species, return blood to the left atrium from the pulmonary circulation in mammalian hearts (8, 9, 12). In the human heart, the free portion of the right atrial appendage is usually triangular in shape while the left is generally tubular (1). Either the right or the left atrial appendage may be larger than the other. The vena cava of the human heart enter the right atrium in-line, one superiorly and one inferiorly, unlike in quadruped mammals (8). 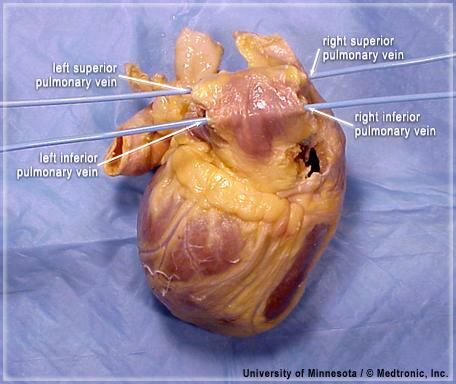 Generally, there are 4 or 5 pulmonary veins that return blood to the left atrium (8, 12). 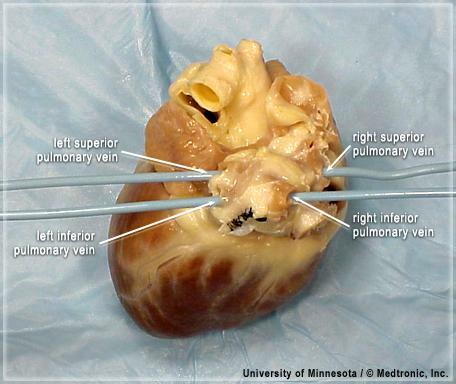 Unlike ovine and porcine hearts, the left azygous vein (hemiazygous) is not present in the human heart (1). 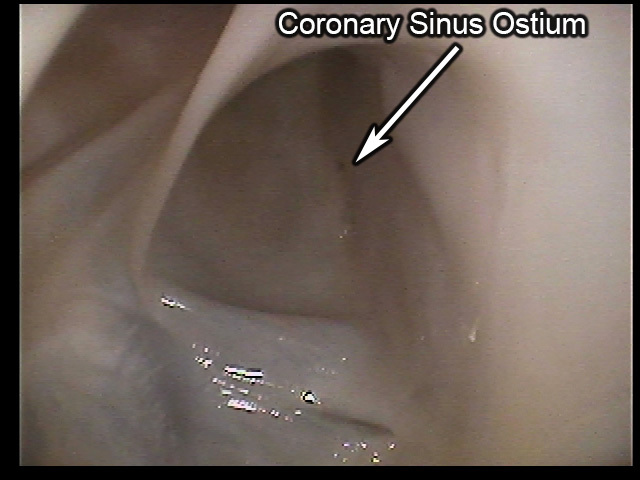 Within the right atria of the human heart, the Thebesian valve covers some aspect of the coronary sinus ostium causing the functional diameter of the coronary sinus to be significantly smaller than in swine or sheep (1). Not taking the Thebesian valve into account though, the superior (postero-lateral) to inferior (antero-septal) coronary sinus ostium diameter of the human heart is significantly larger compared to porcine, canine or ovine hearts and the lateral (inferior) to septal (superior) diameter is similar in size to porcine and ovine hearts but larger than canine (1). The right atrial appendage is generally triangular in shape in the human heart and may be larger or smaller than the left atrial appendage (1). The left atrial appendage is generally tubular in shape in the human heart and may be larger or smaller than the right atrial appendage (1). A view of the septal wall within a human right atrium. 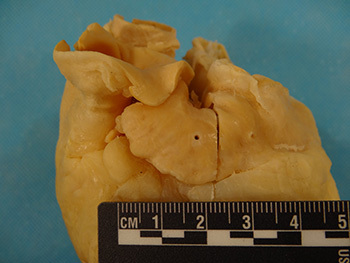 The coronary sinus ostium of the human heart is partially covered by the Thebesian valve, resulting in a smaller functional ostium than in swine or sheep hearts (1). 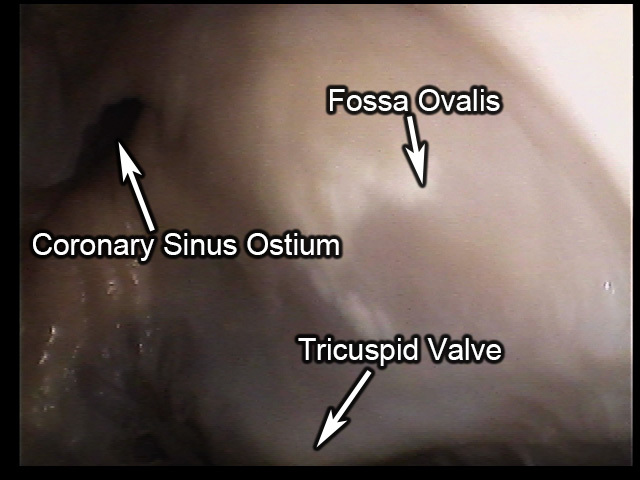 Not taking the valve into account though, the human heart has a larger superior (postero-lateral) to inferior (antero-septal) coronary sinus ostium diameter than the animal hearts here and a larger lateral (inferior) to septal (superior) diameter compared to the hearts of dogs (1). The human heart has 4 or 5 pulmonary veins returning blood from the lungs to the left atrium (1). In this heart, there are 4 pulmonary veins. In the canine heart, both the right and left atrial appendages take a tubular shape and the right is generally larger than, or the same size as, the left (1). Unlike in the human heart, the ostia of the vena cava enter the heart perpendicular to one another (8). The fossa ovalis is positioned much more posteriorly (caudally) when compared to humans, a trait that is also common to the hearts of sheep (3). Canine hearts have numerous pulmonary veins, ranging from 4 to 8, returning blood from the lungs to the left atrium (1). 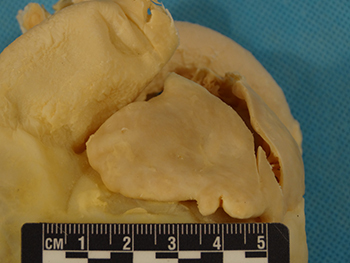 Similar to human hearts, the left azygous vein is not present in the canine heart (1). 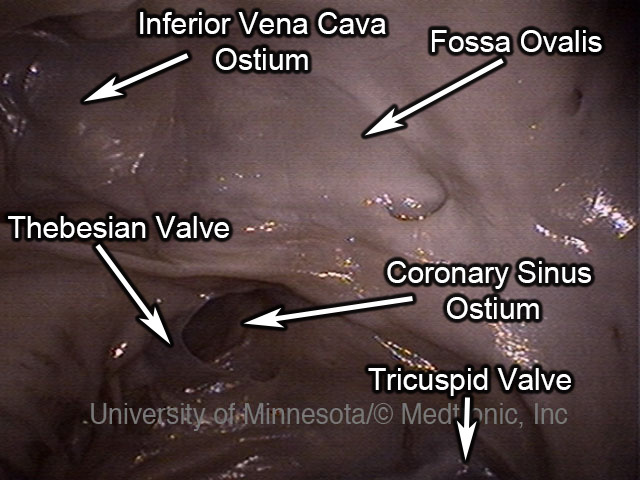 Unlike the human heart, the Thebesian valve does not cover any part of the coronary sinus ostium (1). Despite this, the functional ostium of the canine coronary sinus remains similar in size to humans. Likewise, both the lateral (inferior) to septal (superior) diameter and the superior (postero-lateral) to inferior (antero-septal) diameter are smaller compared to humans when the Thebesian valve is not accounted for. The lateral (inferior) to septal (superior) diameter of the coronary sinus is also significantly smaller in the canine heart than in both the swine and ovine heart (1). The right atrial appendage is generally tubular in the canine heart and is larger than or similar in size to the left atrial appendage (1). 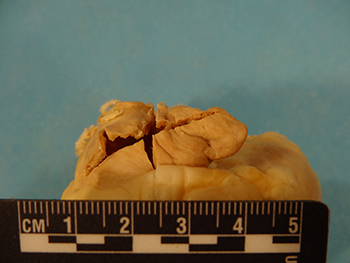 The left atrial appendage is usually tubular in the canine heart and may be smaller than or similar in size to the right atrial appendage (1). Anywhere from 4 to 8 pulmonary veins may be present in the hearts of dogs to return blood to the left atrium from the lungs (1). In this particular heart, 4 pulmonary veins are present. An internal view of the septal wall within a canine right atrium. 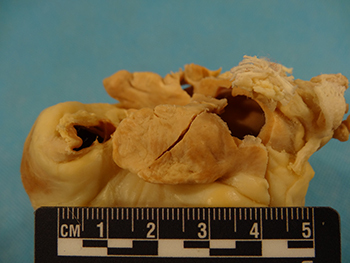 The coronary sinus ostium of the canine heart is not covered by the Thebesian valve like in the human heart (1). Despite this, the ostium is generally smaller compared to the ostiums of humans, dogs or sheep. The fossa ovalis of the canine heart is more posteriorly (caudally) positioned compared to the fossa ovalis of humans (3). In the ovine heart, the right atrial appendage typically has a half-moon shape and is larger while the left is triangular and smaller (1). As is common in quadrupeds, the ostia of the vena cava enter the right atrium perpendicularly (8). The left azygous vein is present in ovine hearts as a tributary to the coronary sinus, delivering blood directly from the body to the heart (1, 3). Relative to the human heart, the fossa ovalis of the ovine heart is much more posteriorly positioned, similar to that seen in canines (3). Similar to the human heart, the ovine heart has 2 to 4 pulmonary veins returning blood to the left atrium from the lungs (1). 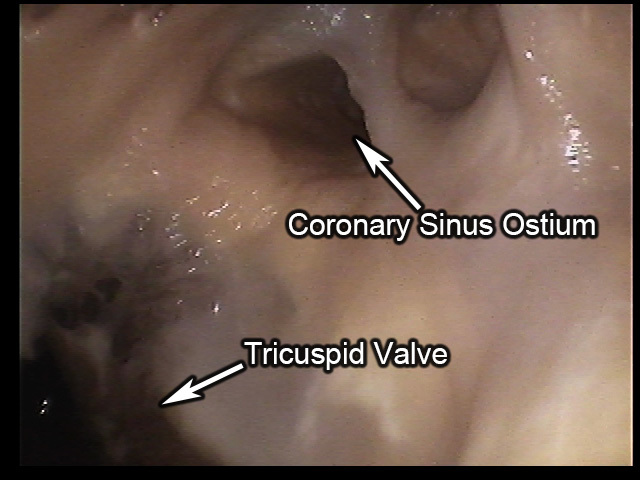 Unlike in humans, the Thebesian valve does not cover part of the coronary sinus ostium resulting in a larger functional coronary sinus ostium compared to humans (1). Not taking the valve into account though, the coronary sinus ostium of the ovine heart has a significantly smaller superior (postero-lateral) to inferior (antero-septal) diameter than in humans but similar lateral (inferior) to septal (superior) diameter (1). Compared to the other animals here, the coronary sinus ostium of the ovine heart is similar in size to that of swine and large than in canines. The right atrial appendage is generally half-moon in shape in the hearts of sheep and is larger than the left atrial appendage (1). The left atrial appendage is generally triangular in shape in the hearts of sheep and is smaller than the right atrial appendage (1). The fossa ovalis of the ovine heart is more posteriorly positioned compared to the fossa ovalis of the human heart (3). 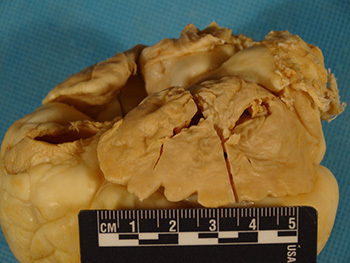 The coronary sinus ostium of the ovine heart is not covered by the Thebesian valve as it is in humans, resulting in a larger functional diameter (1). Compared to swine, the ostium of the ovine heart is similar in size. Compared to dogs, the ostium is larger (1). In the porcine heart, the right atrial appendage typically has a half-moon shape and is smaller while the left is usually triangular and larger (1). Unlike in the human heart, the vena cava enter the right atrium perpendicular to each other. The left azygous vein is present as a tributary to the coronary sinus, returning blood directly from the body to the heart (1, 8). Compared to humans, the fossa ovalis is both deeper and more superiorly positioned in the porcine heart (8). 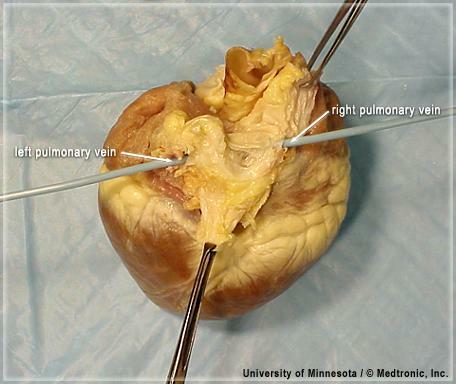 The porcine heart typically has 2 pulmonary veins returning to the left atrium (1). 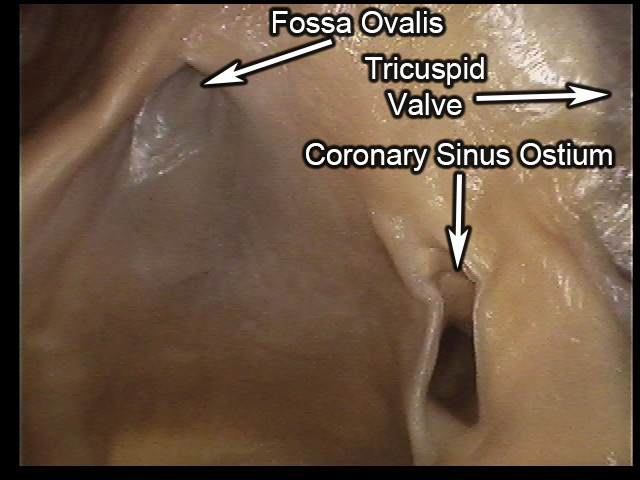 Like the sheep heart, the Thebesian valve does not cover part of the coronary sinus ostium resulting in a larger functional coronary sinus ostium than in humans (1). However, not taking the valve into account, the superior (postero-lateral) to inferior (antero-septal) diameter of the coronary sinus ostium is large in humans than in swine but the lateral (inferior) to septal (superior) diameter is similar in measure. Compared to ovine hearts, these dimensions are all similar (1). Compared to canine hearts, the superior to inferior diameter is similar but the lateral to septal diameter is larger. The right atrial appendage is usually half-moon in shape in the hearts of swine and is generally smaller than the left atrial appendage (1). The left atrial appendage is generally triangular in shape in the hearts of swine and is usually larger than the right atrial appendage (1). The hearts of swine have two pulmonary veins returning oxygenated blood from the lungs to the left atrium of the heart (1). 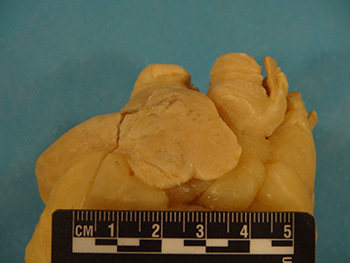 The coronary sinus ostium of the swine heart is not covered by the Thebesian valve resulting in a larger functional ostium diameter compared to humans (1). 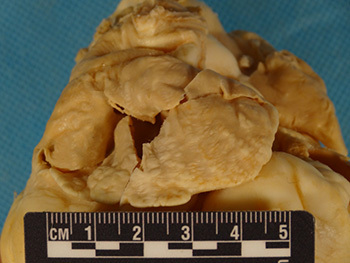 Not taking the valve into account, the ostium is smaller in diameter than in the human heart. Compared to the other animals, the coronary sinus ostium is similar in size to that of the ovine heart and larger than in the canine heart (1). 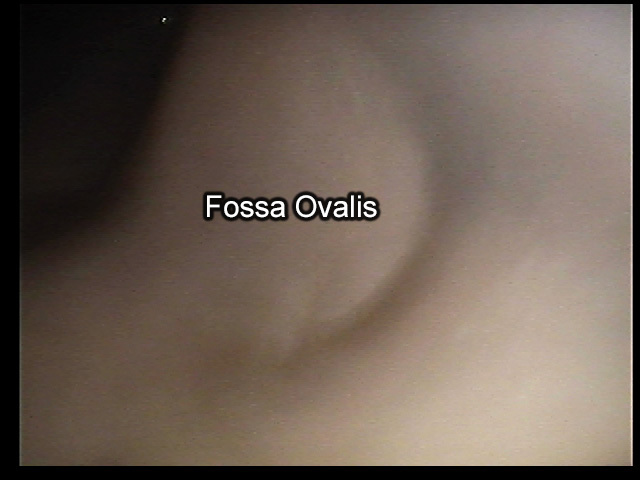 A swine fossa ovalis, located on the septal wall within the right atrium, is pictured here. The porcine fossa ovalis is both deeper and more superiorly positioned compared to the fossa ovalis of human hearts.